Café Jen is the main eatery of Hotel Jen Penang. Located next to the lobby, the dining section features a minimalist design with a touch of modernity. 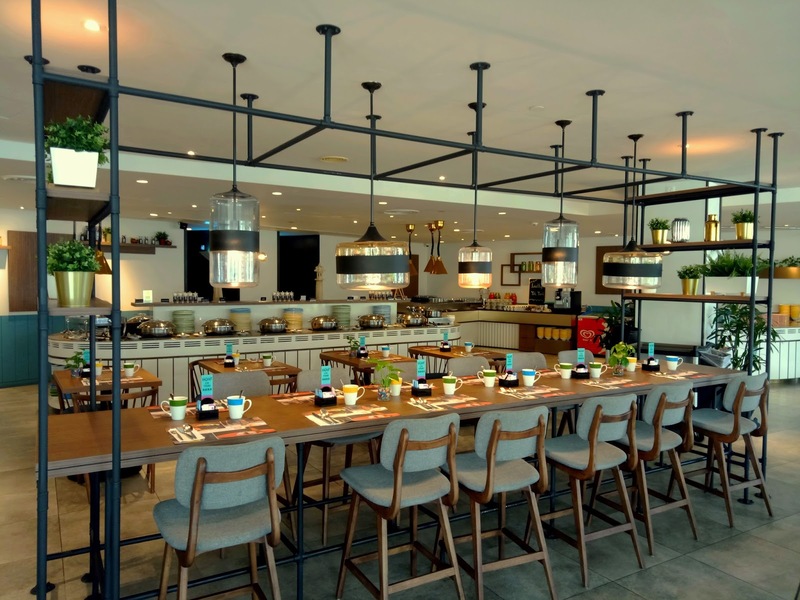 Wooden tables and shelves are decorated with potted plants to create a casual ambience. As for the menu, Café Jen serves a combination of Asian cuisines and international flavors. 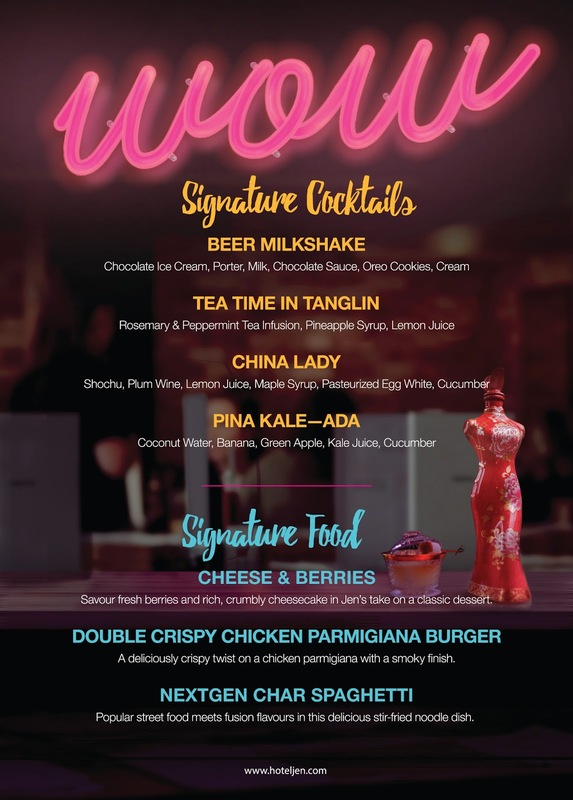 The hotel has recently launched the signature food and cocktail menu. This promotion runs concurrently at all Hotel Jen properties and is available until 30 April 2018. 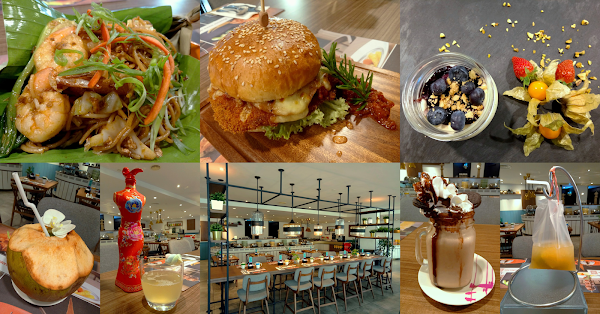 The menu covers 3 dishes and 4 special drinks that are specially crafted to suit the trendy clientele of Hotel Jen. Customers have a choice to dine at either Café Jen or the adjacent Lobby Lounge. In lieu of cash, Hotel Jen also accepts payment in terms of Golden Circle (GC) award points. 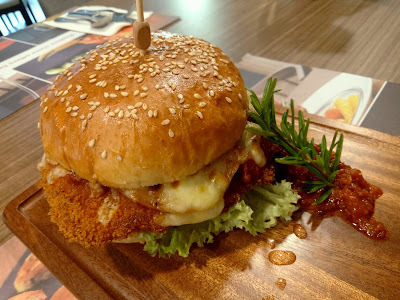 One of the menu's highlights is the Double Crispy Chicken Parmigiana Burger (RM28.00 or 70 GC), which is quite large for a single diner. Fried to golden perfection, the breaded chicken cutlet is topped with molten cheese for a sharp taste. Also sandwiched by a large sesame bun are romaine lettuce and tomato coulis. A rosemary sprig on the side lends its herbal fragrance. 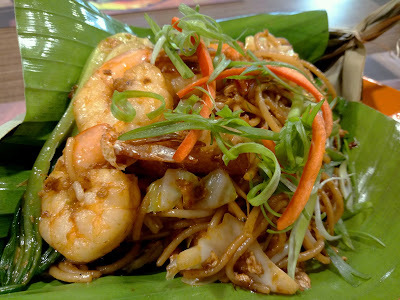 NEXTGen Char Spaghetti (RM28.00 or 70 GC) is inspired by Penang's famous char koay teow (炒粿条). But instead of flat rice noodle, this dish uses spaghetti for the extra springiness. The pasta is cooked with shrimps, squids, fishcake, egg, cabbage, bok choy (小白菜) and garlic. Chili is not included by default, but diners can always request for a spicy version. I love the "fiery aroma" (镬气) of this dish. As for something lighter, Cheese & Berries (RM15.00 or 40 GC) is the perfect choice. 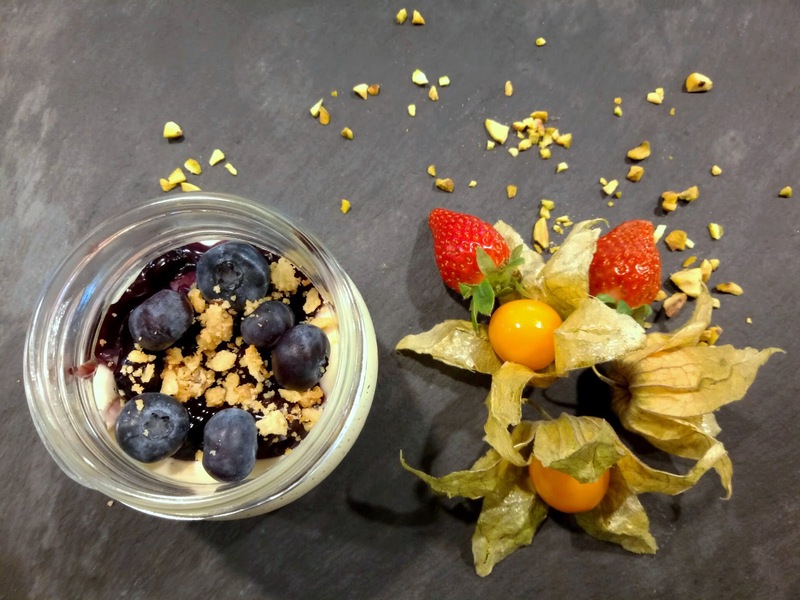 Served in a jar, the cheesecake is topped with fresh blueberries and blueberry sauce. Tapping into the pastry chef's forte, the dessert presents a rich taste of cheese without overwhelming the palate with too much sweetness. Meanwhile, gooseberries and strawberries are used as part of the dessert's plating. 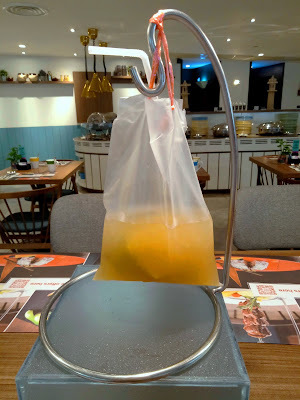 Tea Time In Tanglin (RM30.00 or 75 GC) is a specially crafted drink that goes well with any occasion. 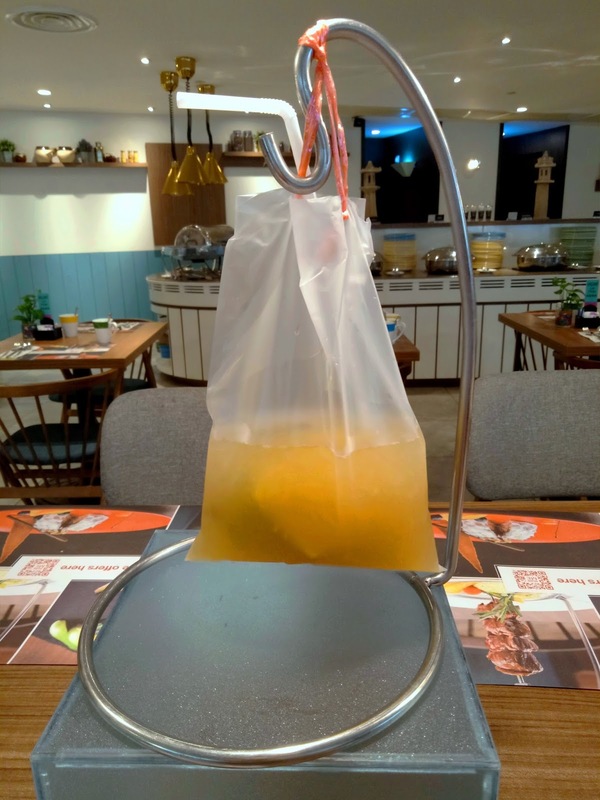 Named after an area in Singapore in which Hotel Jen has another property, the chilled tea is presented in a transparent plastic bag. Infused with rosemary and peppermint, the drink carries soothing tanginess of lemon and pineapple juice. Pina Kale-Ada (RM30.00 or 75 GC) is inspired by piña colada, a sweet cocktail based on pineapple juice. However instead of a pineapple, Pina Kale-Ada is served in a hollowed young coconut. 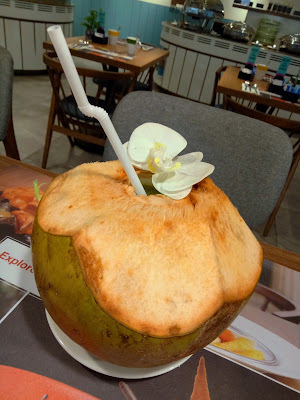 Using coconut water as the base, the greenish drink also includes the juices of green apple, cucumber, banana and kale. 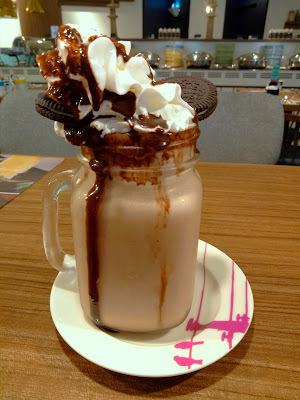 One of my favorite drinks this evening is the Beer Milkshake (RM30.00 or 75 GC). The viscous emulsion is a special concoction of milk, Guinness stout and chocolate ice cream. The milkshake is topped with whipped cream, chocolate sauce and Oreo cookies for aesthetic appeal, but these toppings have minimal role in the overall taste. I enjoy the subtle hint of alcoholic bitterness that the drink presents on my tongue. The most alluring drink on the cocktail menu is indisputably the China Lady (RM68.00 or 170 GC). 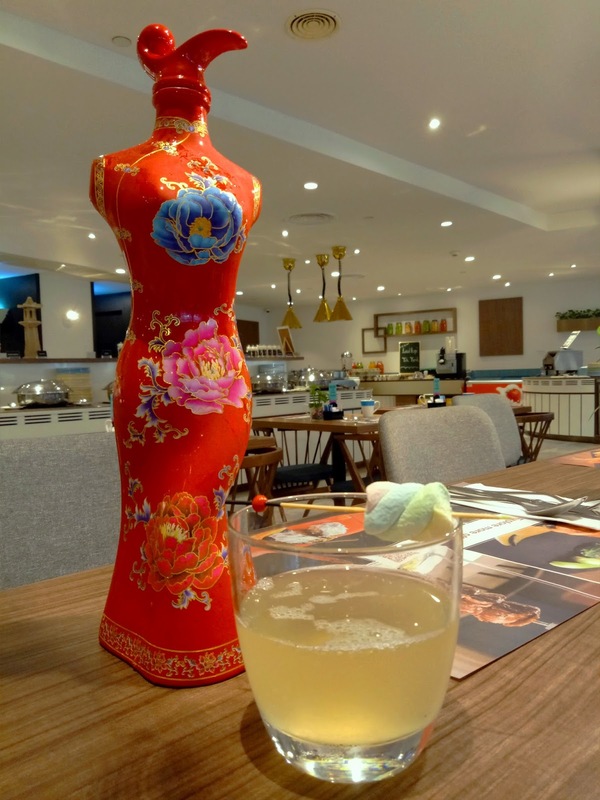 The cocktail is presented in a curvy ceramic bottle that resembles a woman in red cheongsam (旗袍). The drink comprises of shochu (焼酎), plum wine (梅酒), lemon juice, cucumber juice, maple syrup and pasteurized egg white. As soon the bottle cap is opened, my nostrils are greeted by the pleasant scent of Japanese liquor. Besides the signature food and cocktail menu, Café Jen also serves International Buffet Lunch daily and Themed Buffet Dinner on Friday and Saturday evenings. 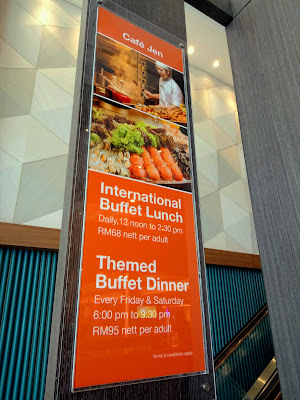 To reward early birds, the restaurant also offers buffet vouchers at discounted prices. Furthermore, Café Jen throws in a free voucher for every 10 voucher purchased. This offer is valid until 30 April 2018 only. Directions: Hotel Jen is located at Magazine Road (Jalan Magazine), next to 1st Avenue Mall and just opposite of The Wembley. 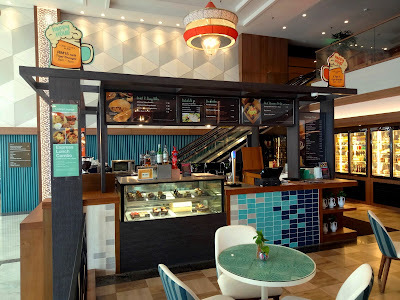 Café Jen is located at Lobby Level of the hotel. The hotel provides parking in its basement levels. Customers enjoy complimentary parking for the first 2 hours.